A single word spoken at the right time can change someone's life! Bio: I am an Author, Professional Speaker and Life Strategist that's committed to inspiring audiences to become their best possible self. Through the use of personal stories and life lessons, I engage the audience with laughter and dialogue; allowing them to think critically about barriers that are preventing them from living up to their potential. With several years of speaking and coaching experience, I specialize in helping adults both young and old clarify their personal vision, understand their life's mission and establish core values to live by. KEYNOTE OVERVIEW: I focus on utilizing the power of perspective in all of my speaking to draw the audience into the moment, so they have an experience; rather than hear a speech!. 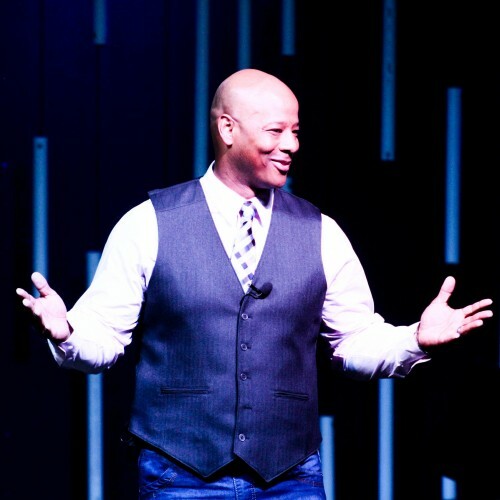 "Are You the One" : This keynote will make the audience laugh, cry and think; as they're challenged to answer the most introspective question that anyone can ask of themself; "are you the one?" "Accepting the Call" : This keynote calls upon each of us to accept our unique purpose to make the world better than the way we found it by, taking advantage of the unique opportunities we have to serve and meet the needs of others. "History or Destiny" : We all have a past that has helped to shape us. In this keynote the audience is challenged to make the sometimes difficult decision to let go of the past and move forward toward a brighter future! "Let It Shine In: In this keynote the audience is challenged to take advantage of the opportunities life presents today, while the opportunity still presents itself. The Blueprint: This full day workshop is tailored to help individuals gain clarity and direction in life, by guiding participants to establish a clear Vision, Mission and Core Values to live by. Participants leave this workshop changed forever! Alpha: Every boy wants to be a man! Every man wants to be a leader! Every leader wants to be an alpha! This life changing workshop is designed to inspire men to be leaders in their own lives, communities and for their families! In this workshop we peel back the layers of manhood (Integrity, Character, Courage, Discipline) to help participants understand what it truly is to be a man. Find out more about The Change Agent! at http://www.melvinbanksinspires.com.